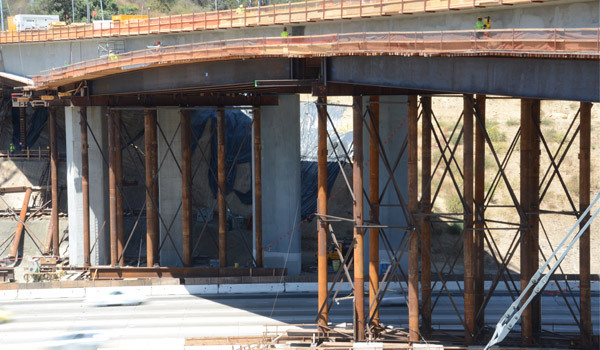 This photo shows falsework previously installed for the rebuilt side of the Mulholland Bridge. Work crews will install falsework over the Southbound I-405 for the north side of the bridge that has yet to be built. The I-405 Sepulveda Pass Improvements contractor is scheduled to implement a full southbound-only freeway closure for approximately four miles between the U.S. 101 and Getty Center Drive ramps on the night of Saturday, March 9, 2013 to construct falsework for the Mulholland Bridge in the Sepulveda Pass. The project contractor will place plate girders for the span of the bridge in the Southbound direction of the freeway. The bridge deck will be constructed on top of these temporary plate girders once installed. Ramps within the freeway closures limits may begin to close as early as 7 p.m. and freeway lanes will begin to close as early as 11 p.m., leading up to the full directional freeway closure beginning at 1 a.m. and ending at 7 a.m. Sunday morning, weather permitting. When: Full directional southbound freeway closures are anticipated to occur on Saturday, March 9, 2013, weather permitting. Each night, ramps within the freeway closures limits may begin to close as early as 7 p.m. and freeway lanes will begin to close as early as 11:00 pm, leading up to the full directional freeway closure beginning at 1:00 a.m.
For real-time traffic conditions, visit Caltrans web site at http://quickmap.dot.ca.gov.